Spring Flowering Bulbs Start Now | Cherokee Co N.C.
Now that fall is officially here, does the thought of a long cold winter have you down? Have you considered a landscape full of spring flowering bulbs? It’s that burst of spring color that makes you feel good. Best of all, most spring flowering bulbs aren’t expensive or hard to grow. What those gorgeous spring flowers do require, though, is that you start working on this project in the fall. Spring flowering bulbs must go through a period of cold temperatures before they will sprout in the spring. Because of this, purchase bulbs from a commercial source now to be sure you get the high-quality bulbs you want in time to plant them. Early spring favorites include crocus, grape hyacinth, tulip, narcissus and scilla. Popular mid-to-late spring bulbs include hyacinth, ipheion, and tulips. Store your new bulbs in the bottom compartment of your refrigerator until time to plant, which will be in a few weeks. Keep them in their original packaging or put them in a paper bag full of fresh sawdust or clean straw. Where you will plant them is an important part of the planning. It’s not hard to decide – just think like a bulb! You can even plant small bulbs like crocus directly into your lawn but remember that the area can’t be mowed until the foliage dies down. Whatever bulbs you plant, and wherever you plant them, none will survive if planted in soggy, poorly drained soil. Don’t plant them on the shady side of the house either, or under groupings of pines. Some shade is fine. Prepare a bulb bed by digging up the soil at least six inches deeper than you plan to set the bulbs. Add a complete fertilizer, like 10-10-10, and garden lime according to package instructions or soil sample results and adjust for your flowerbed size, then mix soil thoroughly. 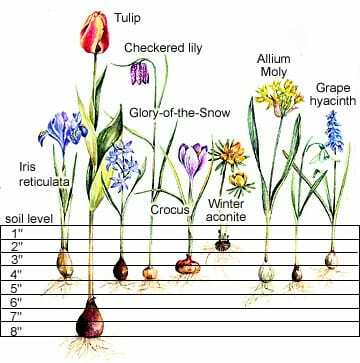 The golden rule for bulb planting is to place them upright in the soil at a depth of at least three times their diameter. A one-inch diameter tulip can be planted three inches deep, and so on. Space most bulbs about one bulb-diameter apart for the best color effect. Narcissus bulbs can be spaced at twice their diameter. Water all bulb plantings immediately to settle the soil and start root growth. If the winter is dry, you may want to water once a month just to be safe. Two inches of pine straw, bark chips, straw, sawdust or some other mulch will enable your bulbs to over winter successfully. Next spring, gently check under the mulch for signs of new shoots. Some mulch such as sawdust and leaf compost can get clumpy and heavy, to the point of hindering new shoots. Gently removing or breaking up the mulch as the shoots appear will prevent any disappointments. A final caution: don’t apply fertilizer just before the spring bloom because the fertilizer can damage the newly emerging flowers. It’s best to top-dress with the necessary fertilizers in December after the cold weather has come. For more information, contact me at the Extension office.